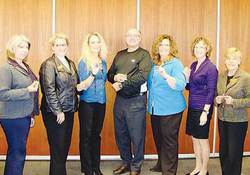 On behalf of the Black Gold Regional School division, the trustees were each awarded their long service award pins on October 9, 2013. The Superintendent of Black Gold Regional Schools (BGRS), Dr. Norman Yanitski, was presented an award by the Board of Education at the divisions ‘Welcome Back’ ceremony held at the Leduc Composite School last month. Every year the BGRS board hosts a Welcome Back event, the ceremony is held on the first professional development (PD) day within the division, it used to be held in the afternoon years ago but has become more of a hit since it has changed to the mornings. The event, attended by all BGRS staff, starts off with a light continental breakfast and provides an opportunity for central office administration and school trustees to share annual goals, recognize accomplishments by the Division and to commend those that that are presented with a long service award. Superintendent Yanitski shares his appreciation of the annual event by commenting that the ‘welcome back’ is something that the board does a great job at and that the staff really appreciate it. He feels that it is a great opportunity for the administrators to meet the teaching staff, including new teachers as well as the support staff. This year for the first time the Board of Education presented a new award called “Inspiring Success- Award of Distinction,” and the recipient of that award was the division’s superintendent Dr. Norman Yanitski. At the recent BGRS board meeting, trustees and staff were ecstatic to once again acknowledge his hard work and dedication to the school. Sandy Koroll, Board Chair for BGRS, commends the superintendent acknowledging his efforts. “Your leadership has been exemplary in realizing the triumphs and meeting the challenges of our division,” she says. Koroll continued giving her admiration for everything that Yanitski does; while she talked, the board silently approved her words with smiles and nods. “We appreciate and admire how much you love interacting with students and our staff, you feed off of their energy and in turn you add to it. Your face lights up every time you share a story, be it challenging or entertaining, you too continue to learn something new every day” adds Koroll. Koroll’s words were echoed by many of the trustees; it was obvious that this man had really inspired everybody with his hard work and dedication. Calvin Monty, BGRS Associate Superintendent, Human Resources & Administration said that he would not have gotten through his first year without Yanitski’s support. Monty thanked him for his guidance and knowledge, and added his amazement on how supportive, encouraging and passionate Yanitski is on a daily basis. Yanitski shared how surprised and shocked he was to receive the award, he said that he thought they might have been up to something but he didn’t know what. He thanked the board and assured them that the award would hold a very special place with him and his family. The board then approved a motion to act on the inaugural award of distinction and begin preparing a process for it to become an annual award. Those in favor agreed that this would be a good way to start an annual celebration to recognize and acknowledge the good work in the system. They feel that the award could be something that would be appropriate to seek nominations within the community. They would also like to see the award be unspecific to whoever qualifies to receive the award, for example it could be for a person, department, or possibly a business that inspires success within the schools. It appears that Dr. Norman Yanitski has given so much inspiration to everyone around him that it has now created the possibility of a new award to come to fruition. What started out as an award for an inspiring man, has ended up as an award that will continue to acknowledge future recipients that also echo BGRS core purpose of inspiring success.